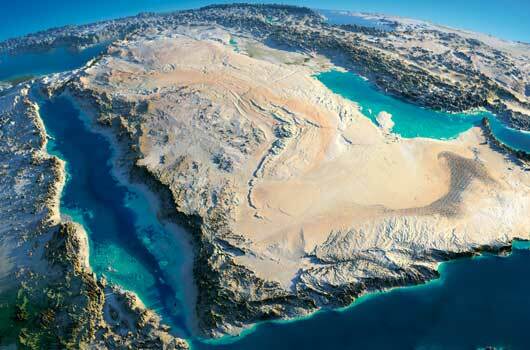 With its semi-arid / arid climate, the MENA region is the world’s most water scarce region. While the area has long been under pressure to adapt to water security and has developed various technical solutions and industrial mechanisms to deal with environmental constraints, water availability is considered to become a constraint to health and socio-economic development by 2030, due to the increasing effects of climate change and population growth. Saudi Arabia, along with much of the MENA region, is projected to experience further decrease in precipitation, up to 20% in the northwest and far southeast. The rise in population, which is anticipated to double by 2050, has made it necessary to develop both the conventional water sources (surface and groundwater) and the unconventional ones (desalination of sea water). The kingdom is already the world’s largest producer of desalinated water and treated wastewater, and has built over 200 dams to utilize surface water which is limited to some localities. While Saudi Arabia aims to recycle 40% of the water used for domestic purposes in urban areas, with water recycling (treatment) plants more recently built in Riyadh and Jeddah, the country needs to continue to invest in supply- and demand-side management strategies to increase the conservation of water. To keep up with population growth, the country has experienced tremendous growth in the agriculture sector in the past decades, which has seen large areas of desert turned into agricultural fields – a major accomplishment for a country that receives an average of four inches of rainfall a year and limited groundwater reserves, with almost negligible recharge rates. But there are many tradeoffs within the nexus; using water for irrigation has promoted food production but this has required an increase in water withdrawal, which in turn, may jeopardize food security in the long-term and take valuable oil reserves to generate the desalinated water needed for agricultural production (in Saudi Arabia more than 1.5 million barrels of oil are burnt a day to provide 50-70% of drinking water through desalination). Globally, agriculture is the largest user of water, accounting for 70% of total withdrawal, more than twice that of industry (23%) and municipal use (8%), and represents 30% of total energy consumption. In Saudi Arabia, agriculture represents almost 90% of water supply.